A southwestern dish of chicken with tortilla chips and some robust spices, gives all the bold flavors to this soup.Sometimes garnished with cilantro, Avocado and Mexican cheese. 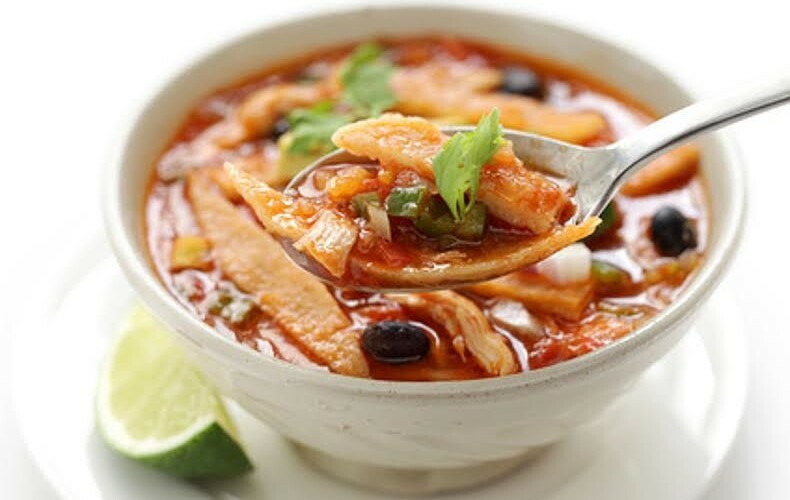 Tortillas are the basis of many Mexican dishes and this chicken tortilla soup is the best way to finish any leftover tortillas. Add chicken pieces, cover and cook for 8-10 min or until light brown. Now add tomatoes, broth, salt, chilli powder, cumin, black pepper and corns. When it starts boiling reduce the heat and simmer for 15-20 min. Before turning off the heat stir in the lime juice. Pour soup into bowls. Top with tortilla strips and cheddar cheese. Serve immediately with lime wedges and some tortilla chips on the side.